Your Prez is currently portable VP9 in Bermuda. I will be on site for about one week and will post a few pictures throughout my stay. 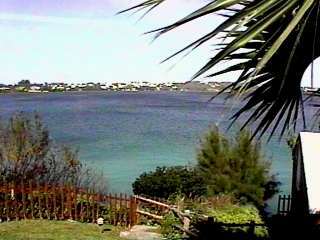 This photo was taken from the balcony of my unit which overlooks Harrington Sound which was formed from the mouth of an ancient volcano that resulted in the islands that eventually became Bermuda. Today is my final day which also happened to be the quarterly meeting for the Radio Society of Bermuda which meets four times a year at the Queens Club in Hamilton Bermuda. Tony VP9HK graciously offered me a ride to the club meeting. With the weather turning quite cold (61 deg F hi hi) the car ride was better than taking the scooter some 7km to the meeting. 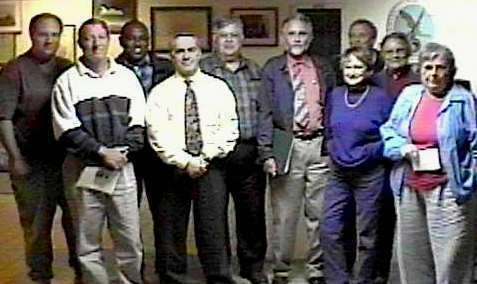 The RSB has some 50 members comprised of both local and overseas hams. The island has just under 100 licenced hams of which less than half are deemed to be active. 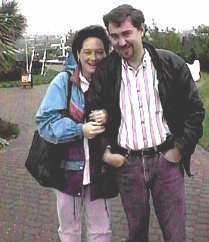 The RSB QSL Manager is Miriam VP9LN (little nurse) who indicated at the meeting the frustration experienced by most QSL managers that being little interest in claiming QSL cards. The RSB is concerned about this since it reflects poorly on QSL reputation of all Society members. The 40th anniversary of the Bermuda Contest is coming up. In the past 40 years there have been 18 Canadian winners of the contest held each year around the 3rd weekend in March. In reviewing the list I noticed that Rocco VE3YJ (then VE3HGZ) and Gary Hammond VE3XN have been past winners in 1981 and 89 respectively. The RSB secretary has invited all past winners to come to Bermuda to help celebrate the 40th anniversary contest weekend which will be held at Fort Hamilton March 20th-22nd. At about 5pm Friday's sunny skies were replaced with clouds and rain. Saturday morning started out much the same but changed to sunny skies by mid morning just in time for the Bank of Butterfield International race Weekend. The Radio Society of Bermuda turned out in full strength to assist in the communications requirement for the Saturday Bermuda International 10K. Glen VP9ID was net control for the event which started and ended at the National Sports Centre in Devonshire. 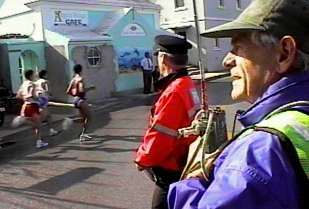 Tony, VP9HK is shown here at the finish line as an official squints to catch the number of the next runner while Bermuda Television captures the event for the evening news. Sunday dawned bright and sunny in time for the 23rd running of the Bermuda International Marathon which saw just under 1,000 runners from around the world registered to participate in the 26 mile event. There were registrants from over 12 countries all hoping to take home part of the $25,000 prize money and break the 2:21.30 hour course record established over the past two years by Russian runners. This photo was taken at Devils Hole where Ted VP9KY was providing communications as the lead runners whizz by Ted on their way to the finish line. 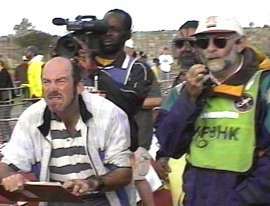 The communications headquarters was in downtown Hamilton adjacent to the start/finish line where Net Control Glen VP9ID and Sergeant John Skinner were set up to exchange race information. Monday afternoon was spent on antenna site visits throughout the central area of the island. At one of the sites I spotted the 2 metre repeater that I have been using while on the island. 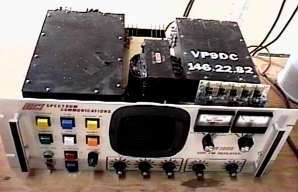 The VP9DC, 146.82 .22 repeater was hard to miss in amongst several commercial repeaters. 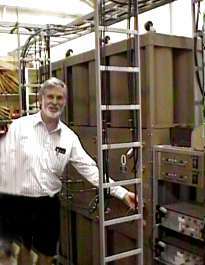 This photo shows a large VHF multicoupler and combiner array at one of my clients larger antenna sites located around the island. 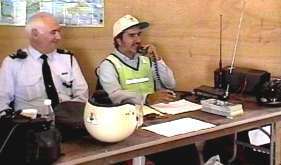 The chap in the picture (Roger) is an ex G8 but has been on the island since the late 50's and while he would like to get back on the air, just has not found the time to do so. 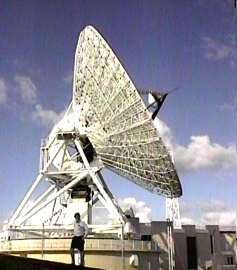 The large dish antenna is a 30 metre monster owned by Cable and Wireless who, until recently, held the exclusive licence for all long distance on and off the island. Now Canadian entrepreneur Mike Keddar who formed CallNet (parent of Sprint Canada) opened competition with his new company TeleBermuda. Both companies primarily utilize fibre optic undersea cables and use satellite for supplementing capacity and as backup in case of a cable cut. 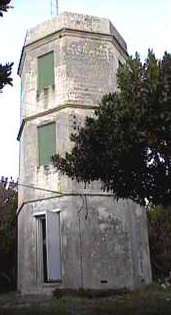 This concrete observation tower was erected in 1908 by a local landowner on the islands highest elevation. 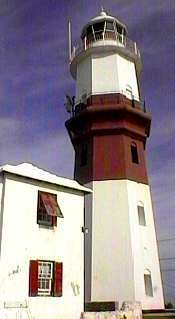 It was the intent of the owner to lure visitors to the top of the tower to view the island from one end to the other. While this can be accomplished, due to the very difficult access, there was no interest shown by local residents and the site became known locally as "Zuil's Folly" named after the land owner in who's family the large tract of land still remains. While never a commercial success as a tourist attraction the site today has a 60 foot tower atop the structure which contains numerous commercial stations including a 4 channel .X25 UHF wireless packet data network. Sunday's weather was more back to the reality of winter in Bermuda with cooler temperatures and rain showers most of the day. I met up with Kevin and Terry Bowles who live in Southampton Parish Bermuda. With today's rain and fog, picture taking was not the best so we enjoyed lunch at the old Navel Yards located at the extreme west end of the Island. Following lunch we returned back to Kevin and Terry's home high above the ocean and cranked up his TS-50 on 20 metres to see who was around and came across Rocco VE3YJ with whom we enjoyed a nice chat. Kevin's antenna is just a short piece of wire into an antenna tuner but it was more than adequate to give us a 59 report. Tomorrow (Monday) is work time so not sure when more pix may get posted. 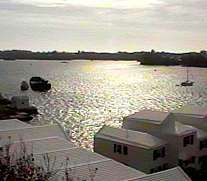 Another great Bermudian winter day (72 degrees) as my client took me on a tour of the east half of the Island. 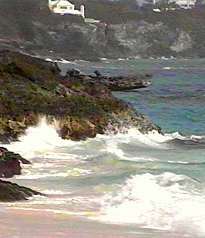 Bermuda was discovered early in the 16th Century however it was not inhabited for another 100 years. St. David is the most easterly point of land and is home to the St. David lighthouse which has been alerting sailors to her dangerous shores for hundreds of years. St. George was the first settlement and was the original capital of the Island. It was later moved to Hamilton which is still the current seat of government. Following the British return of Hong Kong to China, Bermuda has become the largest remaining British Colony. It is also the first country to have been colonized by the British. 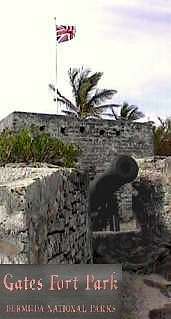 Early naval raids by the Spanish found heavy fortification such as Gates Fort shown here. While at the time the actual fortification infrastructure was quite massive, armament and trained military personnel where apparently quite thin. However, after several rounds from the coastal cannons, the Spanish raiders were sent running with tales of heavy fortification, a story that served the Island well for many years. The Astor family of Titanic fame built this huge estate in the late 1800's. It is reported that Lord and Lady Astor had a bit of a falling out and as such the estate was developed to the left and the right of the main entrance by each of the Astors. Visitors were asked by the doorman who they wished to visit and where then quietly taken to the correct half of the estate. Bermuda has virtually Zero unemployment and one of the worlds highest income per capita at US32,000. There is no income tax on the island however this is offset by other taxes such as on fuel. 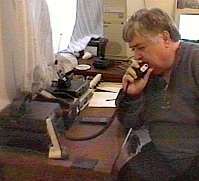 I will try and get on the Trans Canada Net tomorrow (Sunday) 14.140 from Kevin VE3KGB/VP9's QTH in Southampton.